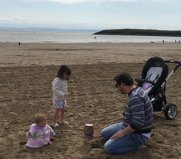 It's been two weeks since Little P, Little N and I made our short journey to Little P's new school (well almost new to her, we had been attending Cylch Ti a Fi there already). She's nursery age and so she only does afternoons at this stage. I know the natural thing is to be teary and sad that my little girl is growing up but in all honesty, she and I were both very excited. We waited at the gate, second in the queue (we had, in fact, arrived first having really underestimated how close the school actually is, but waited in the car because I prefer to see what other people do first!) and a very nice mum asked us if it was Little P's first day. She introduced us to her son who had started the previous term, so was a seasoned expert in a bid to put Little P at ease. She quickly realised there was really no need as Little P and her little boy exchanged a hug and were carried away in conversation in no time. Shortly afterwards the gates were opened and we were invited into her lovely little classroom. This was the only time I felt a little bit sad. Little P has a habit when she's feeling a bit overwhelmed of introducing people to her sister in an attempt to just say something. ANYTHING. (You know the same way we feel when we are in a lift with a stranger?) Anyway, among all the hustle and bustle she was just desperately trying to find someone to engage with and as you'd expect, most people were caught up in their own emotional turmoil. Then along comes my new hero LSA. I've since asked Little P what her name is and she told me it's Mrs Biscuit but there is no Mrs Biscuit on the staff list so go figure... She got Little P settled in a desk and that was it - she was too busy to even say goodbye. Me: So, did you have a fantastic time? Me: Brilliant! What did you do? Little P: Played with toys. Me: Ooh, lovely. Did you make lots of friends? Me: What are their names? Me: You'll have to ask them tomorrow, won't you? At least she's having a good time, she still looks forward to it every day. Mrs C, her teacher, is really lovely so I'm confident that no news is good news, Unfortunately 'no news' doesn't satisfy the curiosity of a nosy mum! I'm taking it. A compliment is a compliment. and who's more honest than children, eh? PS The novelty of uniform has run way out. Two polo shirts is not enough for my washing turn around. A few posts ago I mentioned my crippling fear of spiders. I also made it clear that I really didn't want to pass such a silly thing on to my girls. In a different post I also mentioned Little P's fascination with death. Today's post is a bit of a mixture. On a sunny day last week, Little P and I were pottering in the kitchen with the back door open when she alerted me to the situation. "Mummy, look! There's a buzzy bee stuck on the door" translation - a fly has landed in a spider web on the back door. (note to self: clean door (get Daddy to ask Grampy to clean door)). Before I had time to think, a spider came out of nowhere (you know they do!!) and started making his way towards the fly, thrice his size. I honestly froze. There have been only a few times in my life as a parent where I've been in a situation and instinct wasn't pulling me one way or another. Come on! Where the hell were you? Upon reflection, I don't know if I was more worried for me or for Little P (not bothered about the fly, doubt anyone would miss it). I told a lie to buy myself some time "looks like he's popping over to say hello". As it happened, Fate noticed Instinct was dragging his feet and stepped in to help. The fly tore himself free from his silvery cage, much to the dismay of his captor. Phew! Until next time. PS I'm now accepting commissions for creepy drawings of eyes made on my iPhone. Would make a great Christmas present. So, does anybody else partake in this really poor form of parenting?? I know it's really wrong, unfair and not in the least bit productive but I can't help myself. Just in case there are people reading this who don't know what I'm talking about (saints! ), I'll explain. Saving the Rage is when your child does something that warrants a good telling off but you're in public (library, doctor's surgery, train) and you don't want to draw attention. So they get away with it (or at least receive a reduced scale telling off). Until they are home when you can really 'go to town'. 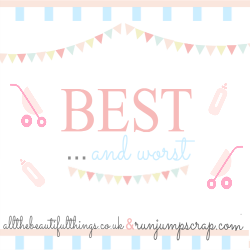 I inflicted said bad parenting on Little P recently. As I've mentioned in a previous post, I really enjoy the weekly shop with my girls so I was furious when Little P's behaviour ruined it for me. To give a bit of background, a few days earlier she had bitten Little N on the arm. Not to sound like one of those 'my child can do no wrong' mothers but this really was out of character for her. They had been playing nicely and the next thing I knew, Little N was distraught. I asked Little P what had happened and she immediately told me she had bitten her and apologised profusely to both of us. Poor Little N was left with a mark on her arm and I was devastated. It certainly took longer for me to forgive Little P than it took her sister. I really lost it and told her biting was one of the worst things you could do and how sad I thought it was that she wanted to hurt her little sister with whom she had been playing so nicely (I was a bit dramatic). After Daddy came home (and I made her tell him what she had done!) she seemed sufficiently remorseful so I tried my best to let it go. Upon reflection, and with a bit of objectivity from Daddy, we decided she had probably been testing her boundaries and was just curious to see what would happen. I thought that after the telling off she received she would never do it again. Skip forward a week and you'd find us at Tesco doing our shop. I was having a nosey of the yoghurt selection when a shriek emerged from Little N followed by big, fat tears rolling down her face to heartbreaking wails. Once again, I hadn't a clue what had happened. I asked Little P if she'd seen her bump her head on the bar. 'I bit her. Sorry, Mummy'. And sure enough, poor Little N's index finger had been chomped. I grabbed her out of the trolley (that they were sharing) and she was completely inconsolable. I muttered a harsh few words to Little P under the deafening screams coming from her sister. Cue every man and his dog coming over to see what was wrong. There was literally a queue of old ladies (all concerned she was fed up with shopping/was hungry/was tired) to whom I had to explain what had actually happened. By this point, Little P had completely lost it and was also howling from her seat in the trolley. I wasn't angry with the spectators, I actually thought it quite nice that they were all so worried(/nosy). I was just getting more cross with Little P. Not only that she had bitten AGAIN, but my previous preaching must have fallen on deaf ears. After an assistant from the cheese counter had been over to see if there was anything she could do, the crowds finally started to clear. In all the fuss, Little P had received a fair bit of moral support from the old dears in such comments as 'you didn't mean it, did you?' and 'aw, you won't do that again, will you?'. Feeling like I didn't want more attention and that it would be a hindrance to me to set them off again, I chose to store my rage for later. So I tried to carry on with my shop; although Little N refused to go back in the trolley (would you get back into a cage with an animal that had already bitten you?). It transpired that Little P had taken comfort in the words of her supporters and was feeling better. She even risked asking if she could still have her treat. The nerve! (apparently one of the ladies had told her she was 'sure she could'. The car journey home was quiet. The littles were just chilling but I was brewing. Poor Little P must have forgotten the whole thing by the time we got in and was so confused when I suddenly let rip at her. This is not effective parenting, people. They have no clue what's going on by this point, you (the parent) have had too much time to think about it - they are not an adult (Daddy, mostly) whom you are trying to outsmart in an argument. In good news, this was over a month ago and she hasn't bitten since! I'm sitting in my living room having a gin after racing around today preparing for Little N's 1st birthday tomorrow. What?? One already?? I know it's such a cliché but this year really has flown by. Little P and Little N could not be more different; I presumed, as they were exposed to the exact same upbringing, they would be very similar. Compared to Little P (just turned 3) Little N seems so much smaller and so much more dependent on me. I returned to work (actually started a new job) full time when Little P was 10 months old and she was fantastic. She loves people and it was a treat for her to go to Nanny's house or to our child minder's (both of whom she loves dearly). She and I were both ready for that change, we both love company. Little N, on the other hand, only has time for me and her sister (and sometimes Daddy if he's being good). I don't know whether I've somehow rubbed off on her because she will probably be my last little baby or whether it's just her personality but I know I'm not sorry. She's so cuddly and affectionate with me and I just want her to be my little baby forever. This anniversary has also reminded me of a time before Little N was even here. When it was just Daddy, Little P and me. I have to try really hard to remember a time before Little N, despite there being two whole years of it. Little P is so laid back she embraced her baby sister and has taken the liberty of showing her the ropes of being my baby (eat everything in sight, food or otherwise). My sister (who has three lovely children) told me the biggest change for her was going from a family of 3 to 4. She said you go from being a couple with a baby to full on family mode and I think I agree. My priorities have changed. I no longer crave the career I once did; I'd rather be at home with my girls. So, happy first birthday to my beautiful little baby girl. Thank you for being so cuddly and for loving me so much. And thank you, Little P, for being an amazingly flexible little girl who is so proud to be a big sister. (Daddy, I think you're alright too). You are my world! Oh my goodness... Nobody could make me feel any worse than I do about this. I am the person whose baby got sunburn. On Saturday a friend and I took Little P and Little N for a picnic at nearby Cosmeston lakes. It felt like lovely picnic weather. The sun was out but there was a nice breeze (damn that bloody breeze!) and we set up camp on a picnic table. Little N stayed in her pushchair while Little P tore through the bag of birthday presents brought for her by our friend. I remember commenting that I had forgotten to return my suncream to my nappy bag after Little N had unpacked it the other day (so if we're looking to blame anyone here, she sealed her own fate!) She remained in her pushchair with the hood up while we chatted and ate and she wasn't really in the sun at this point. Once we'd eaten we moved to the playground so Little P could have a play (and we could have a bit of peace, truth be told). Our friend had brought a picnic blanket so I got Little N out to have a play with us. The air was cool enough that we all kept our cardigans on and that's a rarity for Little P who drops layers at every opportunity. An hour or so must have gone by before we decided to get an ice cream and head home. It wasn't until a couple of hours later I noticed Little N's cheeks were very rosy and she was quite irritable. 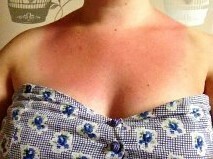 I didn't even think it was sunburn to begin with as it hadn't been that warm. It then dawned on me as the temperature of my own face rose... (Then the back of my neck, my chest and a little patch of leg). Somehow Little P managed to escape any damage, probably due to the shade offered by the pirate ship). I was so upset! I am the last person I expected this to happen to. I'm usually so careful as I have quite pale skin myself and no interest in tanning. They (and I) are usually slathered in factor 50 and I regularly reapply (my health visitor even told me off for overdoing it when Little P was a baby). I made the mistake of seeking the advice of Dr Google only to be met with horrific images and a fresh wave of guilt (advice - do not Google sunburnt baby). Luckily, by the morning, her skin looked back to its usual colour and her temperament was as it always has been (worried and uneasy, in case you're wondering). I wasn't so lucky and am still looking a bit pink. I'm now left facing the decision of whether to keep them indoors for the rest of their lives, lest I forget the suncream again or to buy them some kind of all-in-one beekeeper protective outfit. I certainly won't let my guard down again and allow that gentle breeze to lull me into a false sense of coolness while the scorching sun silently attacks me and my babies! Last week I took the girls to visit my mum (Nana) in Pembrokeshire. She had wanted to take the girls to Folly Farm for ages (for her own benefit really, since they got giraffes) so we opted for the only day of sun, Wednesday. Daddy and I had taken Little P last year when I was about 8 months pregnant and she wasn't quite 2 yet so we didn't last very long that day. I was looking forward to her getting more out of it this time round. Next we had a little go on the games and play areas dotted around the barn. Little N all the while was leisurely kicking back in her pushchair, presumably wondering what all the fuss was about. As it was nearing midday and, as those of you who check in regularly know, my girls like their food (learn more here), we decided to stop for our picnic lunch. This was arguably Little P's favourite part of the day and not even because of the food. Nana tasked her with shooing away a particularly bold (and he really was) seagull. She spent the best part of an hour tearing round our picnic area, weaving between the tables crying 'shoo! Go on, shoo!' to the cheeky bird much to her own amusement as well as that of our fellow picnic-ers. (It was great that she was enjoying herself but seriously, we have plenty of seagulls in Barry, where I have yet to spot a giraffe!) I should probably say at this point that the seagulls were no reflection on Folly Farm which was beautifully maintained. After lunch we moved on to the zoo area. What fascinated me was Little P's reaction to seeing the lions and the giraffes was no greater than when she saw the goat or the chicks. I guess when you are that young, a fat pig is as awe-inspiring as a lion. She just wouldn't understand what a privilege it was to see! Little N finally showing some interest in the animals. Only the wild ones, though. One of my favourite moments of the day came at the meerkat enclosure. They were so cute and appeared to be really playing up to the cameras. I was happily snapping away when the lady next to me squealed 'ooh!! he's brought the baby out!' I craned my neck to see a tiny meerkat baby being held by, what I can now only imagine was his dad (although may have been its mum, but once that seed was planted by squealing lady there was no going back). Immediately about 5 other meerkats gathered around and huddled to protect the baby and I wasn't quick enough to catch a photo. In my head I imagined the conversation between the meerkat mum and dad, who had clearly got carried away with the excitement of the arrival of the royal baby. Meerkat Mum: Pete! What the hell are you doing bringing the baby out here?? Meerkat Dad: Oh, he's alright, Ann. Look! Everyone has come out to see him. Go on, give them a wave. Meerkat Dad: Er, fellas, come and help me hide the baby, would you? After seeing the zoo animals Little P had a little play in the softplay area where she made friends with some little boys while Little N took her afternoon nap. Before we knew it the afternoon had nearly gone. We made it in time for the last tractor train ride which was a nice chance to have a relaxing sit down and a look at the animals (well it would have been if Little N hadn't found a second wind after her nap and was bouncing all over the place as I tried to contain her on my lap). We thought we'd visit the vintage fairground before leaving. Little P had been asking before we even arrived if we could go on the horsey-roundabout, which we deduced was the carousel. She and I went on while Nana and Little N watched from the side. Apparently it wasn't quite dare-devil enough for her and she wanted to seek thrills on one of the bigger rides. She couldn't go on most of them as she's not yet a metre high but we found a waltzer-type ride which only required you to be 90cm - we were in luck! Nana had her reservations and thought Little P would get scared as it was quite fast. In fact she absolutely loved it! After that, and with her eyes barely open she was so tired, we trundled off to the gift shop for them each to choose a treat. Little N got a lovely wooden farm animal puzzle and (after some initial bad choices) Little P chose a pink flamingo puppet. Or as she calls it 'my 'mingo'. We had a fantastic day and both littles had a good night's sleep afterwards! Lions and Spiders and Bears - Oh, My! Does anybody else have any completely irrational fears/phobias? I Feel I should come clean at this point that I don't actually fear lions or bears (which probably would be rational) it just made for a catchy blog post title! I do however loathe spiders. It's ridiculous and I know it but I can't be helped. I don't mean just not wanting to pick them up, this is full on. 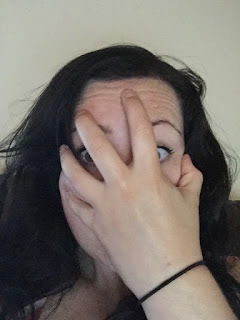 I can spot a spider a mile away (sometimes it's a clump of hair from the washing machine) and it instantly makes my knees buckle and I go all hot - a physical reaction hard to hide from children. What's worse is that Daddy is also afraid of them so there is nobody to pick them up and pretend to the girls they are harmless, helpful fly-catchers which are great for the environment (not the scheming, dangerous, evil creatures we actually know them to be). I suppose I'm grateful that they are pretty much the only thing that bother me (oh and sharks - sometimes I'm too scared to get in the bath in case they come up the plug hole. At least that's rational, though, right? I mean a shark could take your leg off!) as I can fend off a wasp (another of Daddy's Nemeses), bee, ant, frog and I know these are all things people can sometimes be scared of. But the older I get the more stupid and embarrassed I feel when I have a 'reaction'. b) most importantly, I don't want them to feel the way I feel when I see a spider which is terrified (and embarrassed having fallen over and come out in hives). Recently Little P got upset because a woodlouse (don't worry, guys. I've got this one) walked over her foot. As he approached she was amused and was telling me the big ant was coming but a soon as it climbed onto her she burst into tears. In this instance I was able to pick it up and tell her how lovely it was and I thought it was special he'd decided to come and say hello. She went along with this and was excited to tell Daddy when he got home. If this had been a spider she'd have been locked out the back until she had been cleared for access again. How bad does that make me?? If anyone has any ideas/tips on how not to rub your own silliness off on littles, I'm all ears!